Abraham Lincoln has been depicted in movies both serious and silly, from "Abraham Lincoln: Vampire Hunter" to "The Lego Movie" and "Lincoln." For more than 100 years, Hollywood has portrayed Abraham Lincoln as everything from the Great Emancipator who battled slavery to a vampire hunter and a most "excellent" time-traveling adventurer. Though Lincoln the character's first cinematic appearance dates back to 1911 in the silent short "His First Commission," according to IMDB.com, the first biographical portrayal of his life was D.W. Griffith’s 1915 film "Abraham Lincoln." The movie attempts to tell the entire life story of the 16th president in 90 minutes through brief vignettes, consequently oversimplifying or eliminating many details of Lincoln’s presidential years – notably the Gettysburg Address. Filmmaker Steven Spielberg’s "Lincoln" has been acclaimed for its portrayal of events on a broad scale. But Lincoln biographer and content consultant for the movie Harold Holzer said there are intentional "historical bloopers" put in the film for the dramatic effect. "There is no doubt that Spielberg has traveled toward an understanding of Abraham Lincoln more boldly than any other filmmaker before him," Holzer said. Actor Daniel Day-Lewis won a best actor Oscar in 2013 for playing Lincoln in the film. Lincoln may have grown up wielding an axe and splitting logs to make rail fences, but the man nicknamed the "Rail Splitter" was definitely not a "Vampire Hunter." In recent years, there has been a surge of pop culture interpretations and references to Lincoln among the more than 300 depictions in film and television. The short-lived Comedy Central animated series "Clone High" featured a pimply-faced, teenage Abe Lincoln — voiced by "SNL's" Will Forte — who pals around with Mahatma Gandhi and Joan of Arc. 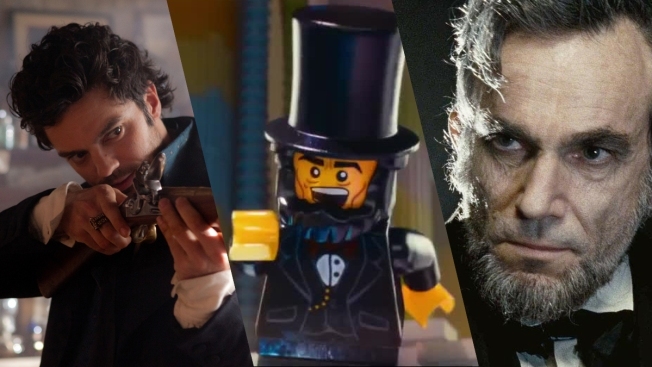 Forte also voiced Lincoln as a master builder in a cameo for "The Lego Movie." Honest Abe also joined forces with Spock and Kirk in "Star Trek" to fight four notorious evil villains, including Genghis Khan, in a battle of good versus evil. His Gettysburg Address-style speech in "Bill and Ted's Excellent Adventure," meanwhile, reminded students to "be excellent to each other, and party on, dudes!" "The Day Lincoln Was Shot"